Of all the games I’ve been curious to try out in first-person mode, I can’t say Age of Empires 2 has ever been high on the list. The Witcher 3, sure. Resident Evil 2, you bet. Age of Empires 2? Not so much. Thankfully my apathy around the situation has done nothing to dampen the spirit and ambition of developer Spriteblood, who has created a comprehensive Age of Empires 2 first-person mod called Overreign. While the game’s classic sprite based art remains largely unchanged and true to the spirit of the game, certain models have been reworked to make sense from this new perspective. It really is quite honestly some of the most impressive modding work I’ve seen in a while, and I’ve seen Mr X in a skimpy thong. Spriteblood has said that graphics aren’t really the focus right now as they’re really just working on making sure everything in the game works as it’s supposed to, but I reckon it looks pretty great as is. 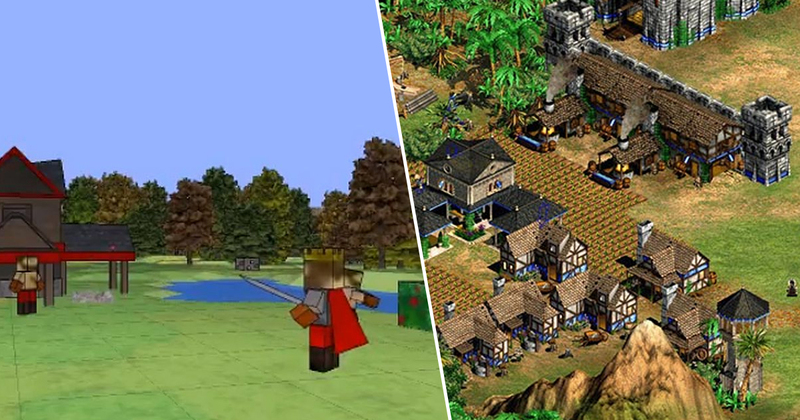 The idea is simple: An Age of Empires-Game played from First Person! The game is called Overreign and you play as the king of your village and must command your units just like in the original games, just from another perspective. This leads to strange new situaions: For instance you must climb watch-towers to see whats behind you town walls or must go with your army to attack the enemy bases. The mod has, for the most part, been greeted with an incredibly enthusiastic reception from the AoE community, most of whom are presumably just happy with any excuse to return to and get new life out of a 20 year old game. Speaking of breathing new life into an old game, there’s a really cool new mod that adds a multiplayer mode to Ocarina of Time. If you’ve ever wanted to explore Hyrule with another Link by your side, you should definitely check that out.